It takes a long time to cook, but it is a fairly easy dish. You could also serve with creamy potato as the polenta requires a bit of effort. Remove the meat from the pan and add the carrot, onion, leek and garlic and cook on a medium heat for 5 mins. Keep stirring to ensure the garlic does not burn. Stir well, and add in the meat along with salt and a good bit of pepper. Place in the oven for 3 hours minimum at 150 C.
To make the polenta, cook the polenta according to instructions. It needs to be constantly stirred or it will go lumpy. When cooked, add in the butter and parmesan and stir well. You can add some cream to loosen it up a little. It should be the consistency of porridge. 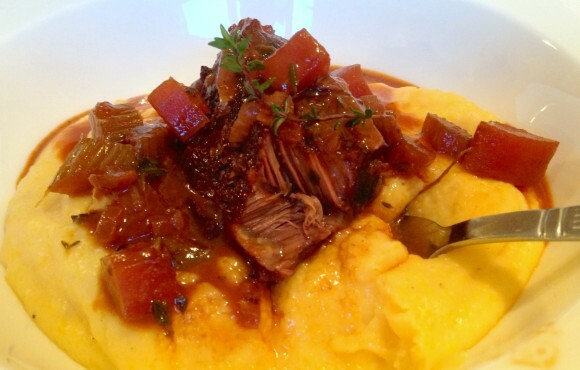 To serve, place some polenta on the plate and top with the meat and sauce.